The integration will enable Bede Gaming’s operator partners to access one of the leading end-to-end sportsbook services, further strengthening Bede’s comprehensive digital platform proposition. Ross Haselhurst, Commercial Director, Bede Gaming, added: “We are committed to providing a compelling product mix to our operators, and sports is no exception. Our ethos is to be supplier agnostic and being able to offer unlimited optionality is at the heart of what we do. I am therefore delighted to welcome SBTech onto our platform and what that gives us going forward. As Bede continue to grow and support some of the biggest and best in our industry it is important that we are able to meet the exacting needs of our operators and SBTech and Bede are perfectly aligned in that regard. Here we go, another document / note / word on the most talked about piece of legislation for decades I hear you say. Well, sort of yes and no. Yes, this is another note on GDPR and yes there has been a lot of commentary and sales pitches about it, a lot of emails, details and prompts to keep in contact but, and crucially there is a but, it’s actually a very good thing. GDPR is a massive overhaul of European data protection legislation and will have an impact on everyone. Whether you’re a business and having to have a greater understanding of exactly what happens with the data you’re responsible for or a consumer who’ll be given the greatest level of data transparency we’ve ever seen. The General Data Protection Regulation (GDPR) is the biggest shake-up of both UK and EU data privacy legislation for 20 years. It creates a single set of rules designed to better protect personal information for people across the EU. All organisations must review how they manage all personal data, such as customer addresses and staff details, to ensure they meet GDPR requirements. It comes into force tomorrow, 25th May 2018 and everyone must be ready. GDPR is forcing businesses to be more open with their customers and is increasing business accountability. It puts shared responsibility on both the data controller and the data processor, meaning both are now liable. There is a two tier fine system for a breach of GDPR regulations. The first is up to 2% of global annual turnover or €10 million. The second is up to 4% of global annual turnover or €20 million, whichever is higher. If you’re still not sure, have a look here at the hundreds of third parties Paypal share data (your data) with. GDPR is driving this transparency. So what is Bede doing to ensure compliance? Well, true to Bede form, we are going above and beyond the requirements to ensure the highest quality data protection and security. In May last year we certified to ISO 27001:2013 and this has given us the framework to build on in support of our GDPR work. We have also have expanded our Information Security, Compliance and Legal functions to ensure we have dedicated people in roles which are entirely responsible for these particular areas. We have been undertaking a number of key tasks, such as reviewing the key suppliers we use, e.g. Microsoft Azure, to make sure they are fit for the purposes of GDPR and to make sure the services we offer customers are of the highest quality. Microsoft Azure as as committed to security and privacy requirements as we are and it’s this commitment to which we hold all our suppliers. GDPR brings into force several new rights for data subjects, such as the Right to Be Forgotten. When it comes to clients’ customer data it is our clients, as the controller to our processor, who will make the decision on acceptance of this type of request. However, once a decision has been made we have the processes in place to erase personal data. An operation that is immediate and irreversible. In short, Bede puts privacy and security at the heart of our thinking in order to assure operators that our technology, and particularly our role as data processor are equipped with the most stringent measures to ensure compliance at the highest level. We are ready, are you?. If you have any questions or would like further information on how we are Supporting Operator GDPR Compliance’ we have created a document of the same name which has been shared with our existing customers, please get in touch using hello@bedegaming.com. 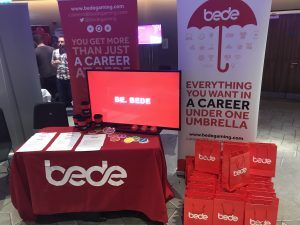 Bede Gaming, an award-winning supplier of software to the online gaming industry, continues to prove its commercial credentials by adding Rocket X to its growing list of prestigious clients. Following the acquisition of intellectual and Property Software (IPS) Ltd in January in January 2018, LeoVegas Mobile Gaming Group (STO:LEO), chose to keep its sites, including top brands 21.co.uk, Slotboss, Bet UK and UK Casino on the Bede Platform. The multi-year agreement between the platform specialists and the leading Swedish gametech company, sees the operator join the likes of The Rank Group (LSE:RNK) and Sun International (JSE: SUI) on Bede’s award winning gaming platform. Rocket X, will take full advantage of Bede’s suite of industry-leading marketing tools and premium content from first class gaming suppliers, such as Yggdrasil, NETENT, Evolution and IGT. Ross Haselhurst, Commercial Director of Bede Gaming, said: “LeoVegas is an innovative, mobile-focused operator at the cutting edge of the online sector. They now have the market’s most effective customer acquisition models through Rocket X and a culture that aligns well with Bede and we are thrilled to be supplying them with our unparalleled platform services. Mark Good, CEO of Rocket X, said: “We are committed to building the industry’s most intuitive and comprehensive online gaming experience, and have started 2018 strongly with a series of important agreements. Platform specialists, Bede Gaming, offers completely flexible gaming solutions with robust security measures, and is fast establishing itself as the first-choice option for innovative operators globally. Founded in 2012, Bede employs the latest in modern technology to provide operators with high performing software used to create world class gaming experiences.